I’d like to introduce you to a brand new business resource website — bizHUMM.com — for all things small business. A lot of care, thought, creativity, valuable knowledge, and pure fun went into producing this website. It was created and directed by my brother-in-law, Laurie Sluser, with help from the Integrated Internet Marketing team at Galaxy Ninja. I’ve known Laurie for a long time. We taught TM together in Montreal over 40 years ago and he married one of my sisters. So we’ve been together as a family for a long time. Laurie started this website with another longtime mutual friend, Ruby Finkelstein. We all live in Fairfield, Iowa. I asked Laurie about his new company, where the idea came from, and what he hopes to accomplish with it. Click image to enlarge details. Ken Chawkin: What exactly is bizHUMM? Laurie Sluser: bizHUMM is a content rich website that offers excellent and practical resources for entrepreneurs, owners and managers to help them grow their small businesses. When you visit our site you will see that we are starting with useful written content and in the coming year we’ll be adding engaging video content, webinars and online training programs — all for small businesses. KC: How did you come up with the idea? LS: Well, I’ve worked in business most of my life. Most recently, for the past 16 years, I ran a national software engineering staffing company. I have had the joy of working with smart people, close friends and family and we all wore many hats. And one experience repeated itself over and over again. A problem would arise and we wanted a solution now. Google is great but the searches for our needs were often unsatisfactory. It was obvious that there was a gap in the market. When I went out on my own last summer I got together with Ruby, a lifelong friend of mine, and we were determined to come up with a solution to this market need. There should be one site with practical answers and useful information for every phase and type of small business — software companies and florists, restaurants and online businesses, consultants and manufacturers. You get the idea — one site that helps all types of small businesses to grow. And from that inspiration bizHUMM emerged. KC: I see you are in Beta (test) mode now. When do you officially launch, and does it cost anything to join? LS: It’s taken us the better part of one year but we are finally there and ready to launch our small business resource website. We just launched our Beta version for about a 5-week period and are limiting ourselves to 1000 founding members. It’s free and very easy to sign up. Please go to http://bizhumm.com and set up your own account. It would mean a great deal to me for you to join our Beta group. Kindly share bizHUMM.com with your friends who you think would benefit, and we really look forward to any feedback you may have. Thanks so much, I appreciate your support! KC: How did you come up with the name, bizHUMM? And who or what is Hummy? LS: Ruby asked me what I wanted to call the business, and the name just burst out of me. It just came right out of the clear blue. Biz, because it had something to do with small business, and humm just came before I could even think about it. So I thought bizHUMM. As soon as I said it, Ruby loved it. He asked me, “How do you spell it?” I answered, “b-i-z-h-u-m-m.” He said, “Shouldn’t it be one m?” And I replied, “No, it’s got to be two m’s.” The whole thing happened in two minutes without thinking. We were laughing, we knew we had a name people would relate to. When I mention it to friends, they love the name. KC: Why do you spell it the way you do? As for Hummy, we wanted a smart, lovable spokesperson with a name that played off of bizHUMM. We came up with the name Henry Hummingbird, or Hummy for short. He’s a tiny hummingbird with big dreams. You can read more about Hummy on his bio page. KC: I notice your website has a HUMM of the day. What is that? LS: The featured post of the day or Humm of the Day is found at the top of the home page each day. But there is a good deal of useful content in every area of business activity. KC: What can anyone running their own business, or working in one, gain from your website? LS: We have a free content website that organizes its posts into 5 main categories of Startups, Sales, Marketing, Technology and Finance. These 5 areas are then broken down into almost 50 subcategories such as Sales Training, SEO, Finance Software and so on. The idea is to have one resource that can introduce you to practical content in any area your small business may need to promote its growth. KC: How can people get more out of your website? Are there any added fees for these services? LS: The site is and will always be free. Later this year, we will introduce a Premium membership program. However, we will be adding free webinars and video content for our regular members as well. KC: Thank you for your time. I wish you a lot of success with this new venture, and success to those fortunate enough to take advantage of your generous time and energy. LS: Thanks Ken. I appreciate you sharing this. Here’s wishing success to all your readers. 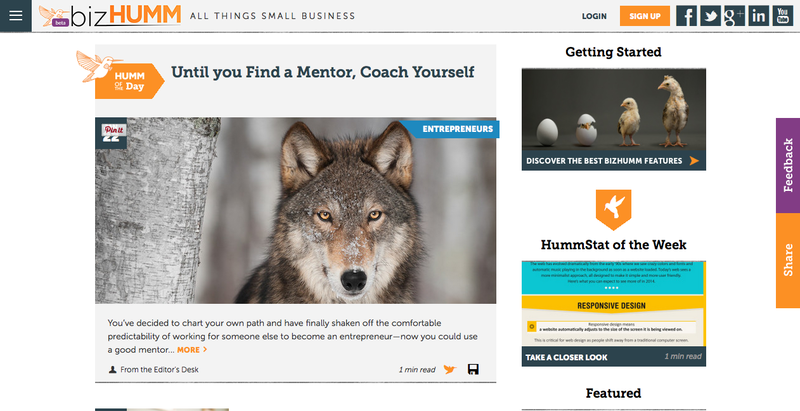 Editor’s note: GETTING STARTED: Discover the 12 most popular bizHUMM features: http://bizhumm.com/getting-started. NEW: Download a PDF of their free ebook: How To Start A Business: The Ultimate Free Guide. Related news: Business startup expert @AsherFergusson featured among @MaharishU successful alumni. See this new TMhome.com INTERVIEW: Laurie Sluser on business success, happiness & meditation. This entry was posted on January 24, 2015 at 12:00 pm and is filed under Articles. You can follow any responses to this entry through the RSS 2.0 feed. You can leave a response, or trackback from your own site.